Today is Nat’l Scrapbook Day . . . and since I’ve just recently started doing a bit of scrapbooking again, I thought I’d share with you. 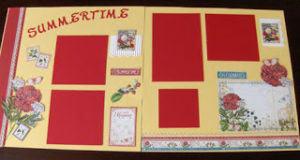 First are 2 pages I did for the quilting group in Lowell, Oregon, as the leader of the group wanted to start keeping a scrapbook of their annual show and sale for Lowell’s “Blackberry Jam” celebration each July. Ruth had given me a couple of fabric scraps from the quilt the group raffled off last summer, as well as some photos from the event . . . so I incorporated all of those into the double-page 12″ x 12″ layout for them. I was pleased with the way it turned out . . . but am already thinking that this year I’d like to go even more “vintage style”, so that will be fun! 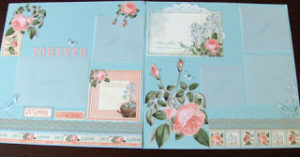 And, for those of you who might like to do some Graphic 45 scrapbooking, I have some kits available for these pages. Everything is already cut for you, in case you don’t like to “fussy cut” . . . all you have to do is glue things down and add your own photos, to make a bright and lovely “summertime” layout! 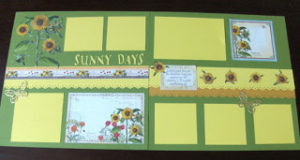 Kits are $15 for the double-page layouts. Email me if you’re interested! Happy Scrapbook Day . . . and Happy Mothers Day tomorrow to all those moms out there! Enjoy your day!